The day after Thanksgiving in 1998, Rita Hester was murdered in Allston — just two days before her 35th birthday. Hester was — by all accounts — glamorous, brilliant, and driven. She was also a transgender woman. Her murder has yet to be solved. Twenty years later, roughly 300 people gathered inside the Cathedral Church of St. Paul in Downtown Crossing for the annual Transgender Day of Remembrance. The event started in Boston after Hester’s death, spread to San Francisco, and is now observed around the world. “[The Day of Remembrance] is a somber day for a lot of us,” said Michelle Tat, who is the board co-chair of the Massachusetts Trans Political Coalition and one of the organizers of Sunday’s Boston event. The program followed a march from Dewey Square to Boston Common, despite the dropping temperatures outside. The attendees wore name tags noting their gender preference, and greeted each other inside the church with hugs and warm smiles. Tamara Tucker, the pastor in charge, welcomed the group to the church and stressed that everyone is welcome at St. Paul, which is part of the Episcopal Diocese of Massachusetts. “Her very presence was a song,” he said. 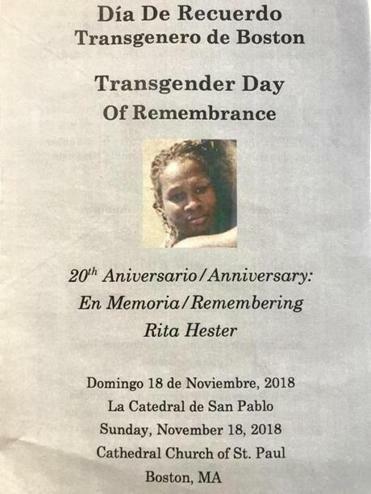 A pamphlet honoring Rita Hester. 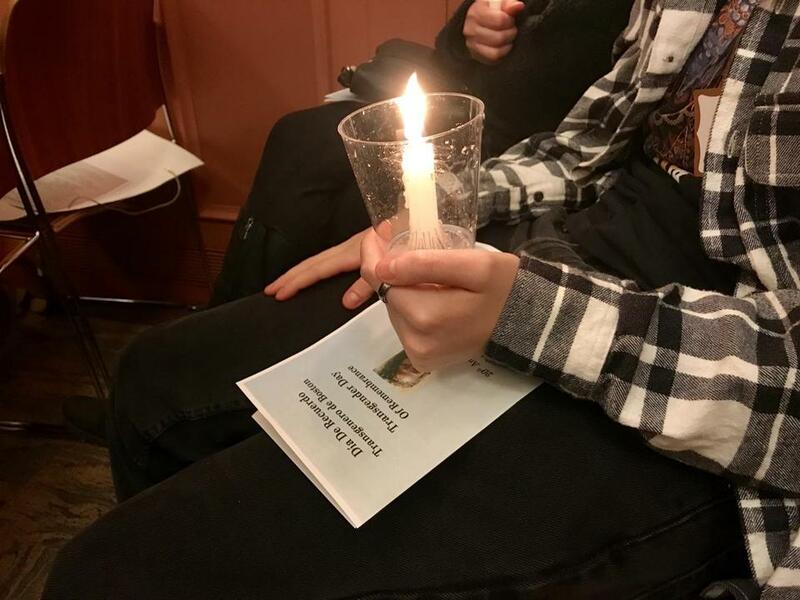 During the program, attendees held white candles as volunteers read dozens of names of transgender people, mostly transgender women, who were murdered in the past year. A slide show projected on two large screens ran throughout the program, with each slide showing the name of a victim from the past year, their location, and how they were killed. “Tortured,” “suffocated,” and “shot by boyfriend,” among a dozen other variations of violence, accompanied photos and names. “Hopefully by saying their names we continue to seek justice for them,” Tat said after all the names were read. Although the service is a reminder of the continued violence against the transgender community, Tat said that the day of remembrance re-energizes her. “This day reminds me who I am fighting for every day,” said Tat. She also said that the passing of Question 3, the transgender accommodations bill on the Massachusetts ballot at the beginning of November, has added enthusiasm to the group. Although the ballot question won by a political landslide — 67 percent of the state voted to approve it — many in the transgender community were fearful leading up to the election, said Fari Sattar, an outreach worker at Fenway Health’s Violence Recovery Program who helped to organize Sunday’s event. Sattar said that his program has seen a significant uptick in cases of sexual assault against transgender people — especially in the wake of the “Me Too” movement, as some are sharing their experiences from years ago, while others feel more empowered to seek help after an assault. But despite the political and cultural progress for the transgender community since Hester’s murder 20 years ago, there is still more work to be done, Tat said. “I hope that we don’t lose that energy,” she said.